And they bound Jesus and led him away and delivered him over to Pilate. And Pilate asked him, “Are you the King of the Jews?” And he answered him, “You have said so.” And the chief priests accused him of many things. And Pilate again asked him, “Have you no answer to make? See how many charges they bring against you.” But Jesus made no further answer, so that Pilate was amazed. But they all cried out together, “Away with this man, and release to us Barabbas” — a man who had been thrown into prison for an insurrection started in the city and for murder. Pilate addressed them once more, desiring to release Jesus, but they kept shouting, “Crucify, crucify him!” A third time he said to them, “Why, what evil has he done? I have found in him no guilt deserving death. I will therefore punish and release him.” But they were urgent, demanding with loud cries that he should be crucified. And their voices prevailed. So Pilate decided that their demand should be granted. He released the man who had been thrown into prison for insurrection and murder, for whom they asked, but he delivered Jesus over to their will. The Jewish leaders had concluded their proceedings and determined that Jesus deserved death. However, the Jewish courts were unable to take a life (see here). They needed to bring their charges to the Roman governor in order to carry out their sentence. The Jews would not enter the house of a Gentile lest they be unclean for the Passover celebration. This was the the worst of hypocrisy! They had assembled a mock trial in order to murder an innocent man, yet they are afraid that a gentile’s house will make them unclean in God’s sight! So Pilate went outside to them and said, “What accusation do you bring against this man?” They answered him, “If this man were not doing evil, we would not have delivered him over to you.” Pilate said to them, “Take him yourselves and judge him by your own law.” The Jews said to him, “It is not lawful for us to put anyone to death.” This was to fulfill the word that Jesus had spoken to show by what kind of death he was going to die. The Jews did not want the Roman governor to question charges. They were essentially saying not to question their charges but to put him to death as they asked. Luke’s account gives a list of false charges that they claimed against Jesus. The only one of these charges that had any truth was that He was the Christ, who was a king. The only one of the charges that apparently got Pilate’s attention was Jesus’ claim to be king. Pilate called Jesus into his headquarters for a private conversation, where he directly asked if He was a king. Pilate asked an official question but Jesus response was personal. He asked Pilate if he wanted to know because of the charges against Him or if Pilate wanted to know for himself. His kingdom is a kingdom of truth and not one will be fought by violence. Pilate had nothing to fear from Him. But when he was accused by the chief priests and elders, he gave no answer. Then Pilate said to him, “Do you not hear how many things they testify against you?” But he gave him no answer, not even to a single charge, so that the governor was greatly amazed. And the chief priests accused him of many things. And Pilate again asked him, “Have you no answer to make? See how many charges they bring against you.” But Jesus made no further answer, so that Pilate was amazed. The chief priests were constantly accusing Jesus to Pilate, but like in the Jewish trial (see here), Jesus kept silent. We see that Pilate reacted with amazement to Jesus’ silence. Pilate’s first attempt to get out of his difficult situation is to send Jesus to Herod. Once he heard that Jesus was from Galilee, he sent Him over to Herod, who was also in Jerusalem. Not only would this absolve Pilate of any blame, but the Jews had less power over Herod. Herod would be free render judgement with much less pressure from the Jews. It is likely that both Pilate and Herod were staying at Herod’s palace in in Jerusalem, so it would not have been far to bring Him to Herod. Herod was glad to see Jesus, hoping to see a miracle. He may also have been hoping to absolve his own conscience from executing John the Baptist (see Matthew 14:1-2; Mark 6:14-17; Luke 9:7-9). But Jesus did not perform any miracle for Herod, nor did He answer any of Herod’s questions. Herod’s amazement turned to ridicule and they ended up mocking him. Herod even put a splendid robe on Him before sending Him back to Pilate. Now at the feast the governor was accustomed to release for the crowd any one prisoner whom they wanted. And they had then a notorious prisoner called Barabbas. Now at the feast he used to release for them one prisoner for whom they asked. And among the rebels in prison, who had committed murder in the insurrection, there was a man called Barabbas. And the crowd came up and began to ask Pilate to do as he usually did for them. Barabbas was a notorious prisoner. He was imprisoned for robbery, insurrection, and murder. He may have led a band of robbers which included the two thieves who were crucified with Jesus. Barabbas was an insurrectionist — the very thing that the Jews had charged against Jesus to Pilate! The Jews had a tradition of releasing one prisoner as part of the Passover celebration. Pilate had apparently kept this tradition for the Jews and allowed them to request a prisoner to be released. Pilate called together the leaders of the people and announced that neither he nor Herod had found Jesus guilty. Pilate’s second attempt to get out of his situation was to offer a compromise. He found the man innocent, yet he offered to punish Him and release Him. Luke’s account also shows the first witness to Jesus’ innocence. Even through his mockery, Herod did not find Jesus guilty of any charges. But you have a custom that I should release one man for you at the Passover. So do you want me to release to you the King of the Jews?” They cried out again, “Not this man, but Barabbas!” Now Barabbas was a robber. And he answered them, saying, “Do you want me to release for you the King of the Jews?” For he perceived that it was out of envy that the chief priests had delivered him up. But the chief priests stirred up the crowd to have him release for them Barabbas instead. But they all cried out together, “Away with this man, and release to us Barabbas” — a man who had been thrown into prison for an insurrection started in the city and for murder. Pilate attempted a shrewd political move with the people for his third attempt to get out of his difficult situation. He knew that the Jewish leaders hated Jesus but He has been popular with the people. Pilate relied on the Passover custom where he would release a prisoner. He gave the people two choices: he would either release Jesus or he would release Barabbas, the notorious prisoner. Matthew’s account shows the second witness to Jesus’ innocence. Pilate’s wife sent him a message to have nothing to do with this “righteous man”. To Pilate’s surprise, the people cry out to release Barabbas! The chief priests and the elders had persuaded the crowd to ask for Barabbas and to destroy Jesus. Pilate was not able to appease either the Jewish leaders or the Jewish people. He sent to have Jesus scourged and mocked. The Roman scourging was the first step of the execution. The weapon, or flagellum, would tear open the prisoner’s back, allowing the wood from the cross to dig deep into the open wounds. Roman citizens (except for deserting soldiers) were exempt from scourging (see also Acts 22:25-29). Pilate then allowed the soldiers to mock Jesus with a crown of thorns and a purple robe. Pilate addressed them once more, desiring to release Jesus, but they kept shouting, “Crucify, crucify him!” A third time he said to them, “Why, what evil has he done? I have found in him no guilt deserving death. I will therefore punish and release him.” But they were urgent, demanding with loud cries that he should be crucified. And their voices prevailed. Pilate’s fourth attempt to get out of this situation was to use Jesus’ pain and humiliation as a way to satiate the bloodthirsty mob. 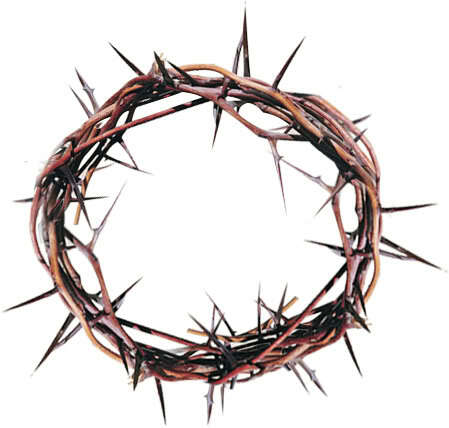 Jesus was now bruised and bleeding, and was dressed like a mock king with his purple robe and crown of thorns. Pilate was still trying to free Jesus when the Jews took the offensive. They told Pilate that Jesus must die according to Jewish law because he made himself the Son of God. This scared Pilate even more so he summoned Jesus for a second private conversation. Why did the term, “Son of God” scare Pilate? Some commentators have proposed that the superstitious Pilate interpreted this to mean that Jesus was a demigod, just like the demigods in Roman mythology. However, a better explanation is that Pilate realized that this was not a legal issue but a religious issue. Pilate was in trouble with Rome because he had so poorly handled the Jews’ religious scruples in the past and he could not afford another problem with the Roman emperor. Once again, Jesus is silent before Pilate’s questions. Pilate says that he has the authority to release Jesus or to crucify Him. Why then does He not answer? Jesus replied to Pilate that the only authority over Him has been granted by God Himself. It is part of God’s plan that Jesus be here at Pilate’s court that day. Pilate is not the wicked one here. He is acting out of ignorance (Acts 3:17), but the wicked one is the high priest (Caiaphas) who has brought Him to Pilate and demanded His death. Pilate tried even harder to release Jesus after his private conversation, but the Jews were insistent. They then forced Pilate to do their bidding with his main weakness. They knew that Pilate was in trouble with Rome. If he allowed Jesus to go free, then they will report him to Caesar! Ironically, the priests swore allegiance to Caesar. They disavowed any Messiah who may come from God and said that they will have no king but Caesar. The time was about the sixth hour. By Roman time reckoning, it was therefore about 6:00 a.m (see here). The Day of Preparation was Friday, the day before the Sabbath, on the Passover week. The crowds were insistent. A riot was forming and they had threatened to tell Caesar if Pilate did not comply. Pilate gave in, but not before performing an Old Testament Jewish ritual to absolve himself of guilt. The Old Testament law (Deuteronomy 21:1-9) prescribed what to do for an unsolved murder. The elders of the town would offer a sacrifice and ceremonially wash their hands, testifying that they were innocent of the man’s blood. In the same way, Pilate washed his hands and said that he was innocent of Jesus’ blood. The Jewish people answered to Pilate that Jesus’ blood will be on them and on their children. No man can hold his children responsible for his own wicked deeds, yet the Jews attempted to pronounce such a curse on themselves. This was literally fulfilled nearly 40 years later, when the Roman legions destroyed the city of Jerusalem in AD 70. Acts 5:28 is an ironic comment by the Jews. The same Sanhedrin that had brought Jesus to Pontius Pilate was then persecuting the apostles for teaching about Jesus. They say, “you intend to bring this man’s blood upon us”! Pilate then released Barabbas and sent Jesus to be crucified. The scourging mentioned in Matthew and Mark’s account is probably the same beating that Jesus had already received (see above for John 19:1). While they were preparing the crucifixion, the entire Roman cohort gathered around Jesus, mocking Him and abusing Him. Matthew’s account says that they put a scarlet robe on him, Mark’s account says that the robe was purple. It was likely an old faded garment that was reddish-purple . John’s gospel account puts the purple robe and the crown of thorns earlier in the narrative (John 19:1-3). Therefore, the purple robe and crown of thorns either happened twice or Matthew and Mark are reporting summaries of all of the Roman tortures here. Alfred Edersheim, The Life and Times of Jesus the Messiah, Book V, CHAPTER XIV. THE MORNING OF GOOD FRIDAY. We do not know the exact location of Pilate’s residence in Jerusalem. Some believe that he may have been in the Fortress Antonia next to the temple, but the majority of scholars believe that Pilate stayed in Herod’s palace on the Western Hill of Jerusalem. Herod’s palace is also closer to both the High Priest’s Palace (where Jesus had been tried by the Sanhedrin) and to the residence of Herod Antipas. Since all of the Roman trials completed by 6 a.m., the closer location (at Herod’s palace) seems more likely.